It was on the top of the Spring Mountain, which is an AVA of Napa Valley that Christopher was waiting for me. But so far, except at Chappellet and Harlan which are on hills, the view of Napa Valley didn’t really impress me… It’s just like the Medoc (Bordeaux), flat and during the winter grey -brown, kind of depressing… but when I arrived at Cain It’s “Whoa!” which came out of my mouth. During the visit of this impressive and beautiful vineyard Christopher explained to me his philosophy, and showed me how his team is pruning, which is such of important part of the “wine” process. Christopher very much enjoyed teasing the Frenchie; usually I would have been annoyed but that time I almost liked it even when he mentioned that he would like to use sommelier’s blood for the clarification of the barrels. In the winery he works with a French wine maker from Cognac with whom we tasted some wines from the barrels. I liked their Malbec; it’s really spicy and opulent. I enjoyed very much: 2008 Blend of Cabernet Sauvignon, Merlot, Cabernet Franc, Malbec, Petit Verdot, Spring Mountain District, Napa Valley, Cain 5 An elegant and fresh nose of strong red fruits, such as raspberries. On the palate, round and fleshy tannins – It’s beautiful. Talking with Christopher was really interesting and constructive. A strong personality and big charisma, a person I won’t forget fast! I didn’t realize when I booked the appointment for the next winery Morlet, located at Saint Helena that the wine maker is actually French and from the Domaine Morlet producer of Champagne. Mr Morlet ended up in California 20 years ago, after an internship in the area which made him look for a good job offer and he met a great Californian woman who became his wife! Together they decided to open their own winery; in 2006 they made their first vintage. I found him to be a perfectionist; his winery is unbelievably clean and well organized. 2009 Billet Doux, late harvest, blend of Sémillion, Sauvignon Blanc, Muscadelle. I like everything about Morlet, their philosophy and the wines themselves. They make the white wine on a Pessac Leognan style and make a sweet wine which is really interesting. The 2009 Passionnément , Cabernet Sauvignon, Napa Valley has an important potential, the nose is intense with darks fruits aromas such as myrtle, the palate has firmer tannins and lively freshness. A wine to keep for aging, but already enjoyable now. I woke up on a really bad moon, lucky me the first tasting of the day gave me my smile back. Frog’s Leap’s wines made me really happy. They sat me on their lovely terrace and left me alone tasting the wines under the sun; it was just perfect. I liked their style, fresh, pure, juicy and elegant. I heard that they weren’t so good not long ago. I noted that they do not have any system of irrigation, the reason why is because they do have naturally between their vine’s row, mustard plant which keeps the water from the winter season to give it to the vineyard during the summer. I enjoy the sharpness of the Chardonnay and love the “2010 Blend of Zinfandel, Petite Syrah and Carigan, Napa Valley”: Powerful nose of intense black cherry aromas; on the palate really elegant and soft, cut down with a refreshing crispiness. It’s Delicious! I appreciate the Petite Syrah too – it was the first time on the trip tasting a 100% Syrah – which gave me the opportunity to try to understand that grape which is new for me. Actually “Petite” Syrah is much bigger than a Syrah. It’s rustic and animal with a strong inky colour. I had to go up into Pritchard’s Hill for my second appointment at Chappellet winery which is one of the older winery of Napa Valley, first vintage in 1969. I will say that the style of Chappellet is the soft version of the American style; a lot of fruit, woody but moderated. 2009 Pritchard Hill, best blocks, blend of Cabernet Sauvignon, Petit Verdot and Merlot: Pleasant nose of crispy small red fruits, toasty aromas. On the palate, opulent and rich, I would have more appreciated it with a touch of acidity. I was a bit disappointed but again I was lucky that day ended as well as it started, as I had the honour to dine with Bob Levy, the well known famous winemaker of Harlan’s wineries and and the wine maker of his own winery Levy & McClellan. He took the time to have dinner just with me, I am amazed. I was at Harlan Estate the day before and I wanted to learn about the Levy & McClellan winery. Bob was waiting for me in a great restaurant at Saint Helena with a bottle of his first wine on the vintage 2008. It’s a blend of Cabernet Sauvignon, Cabernet Franc and Petit Verdot. He does the Fermentation in the barrels! That impressed me, to file up a barrel with the grapes in state of the juice it’s a huge work. But before he de-stemed the grapes by hands! Just like Chateau Pape Clement. He has 2.5 ha of vineyard and makes two red wines from it. The vineyard is located on the far north of Napa Valley and the winery at Oakville, not far from Saint Helena. I would say that Bob’s wine “2008 first wine” during a blend tasting is really difficult to place in the Napa Valley. It’s more like a Grand Cru from Bordeaux; a wonderful and deep nose of blackcurrants, on the palate the tannins are really well incorporated into the structure of the wine and leave a smooth mouth. It’s beautiful! His second wine is from a different selection of grapes and with more Merlot in the blend. I hope to have the chance to taste it once. Thanks Bob for that amazing time – you made my day! I began that new week early in the morning with a tasting at Silver Oak. Their first vintage was 1972 and owned by Ray Duncan and their wine maker is Daniel Barren who worked for Petrus quiet some time ago. 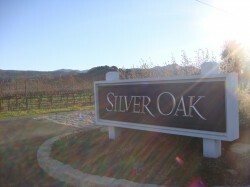 They called their winery Silver Oak because they are right between Oakville and Silverado Trail. To be honest I had some preconceived idea about that winey, I heard that they are using only American wood barrels for the aging, so I was expecting some really woody, big wine. I was right, they use only American barrels but I was wrong on the fact that their wines are not as woody and big as I thought. Their most famous wine from Alexandra Valley is usually fresher since that vineyard of Alexandra Valley is on the north of Sonoma. They work their grapes separately and use New American oak barrels for about 2 years of aging. I will remember very much the Cabernet Sauvignon 2001: A very pleasant and complex nose of blackcurrant and some touch of leather, slightly meaty. On the palate really fresh and elegant for a Cabernet aged in new oak American barrel with tight tannins and a long length. My second tasting was just across Silver Oak at the Saddleback winery, a winery which opened is the 80s. Their winemaker is the famous Nils Venge who became so popular because he is the first American who obtained 100 pts from Robert Parker with one of the wine that he made on Stage Leaps. Arriving in the winery of Saddleback was like arriving into really typical small winery in Burgundy. No fancy tasting room, just a simple messy room with the lovely smell of a typical wine cellar, just the way I like it! It was one of my first times tasting the Zinfandel grape, which is originally from Croatia and called “Primitivo” in Italy. That grape has the particularity to grow as a bush vine and gives some spicy aromas the wine maker said that it could be recognized because of the “BBQ” aromas that it gives. I liked very much the 2010 Viognier, Clarksburg, Napa Valley: The fresh nose is on some fermenting aromas “yeast”, such as English candy and banana. The mouth is warm and opulent cut down by a crispy freshness finishing on a long length. I was so happy to be so welcome at the HARLAN winery at Oakville by the amazing Mr Weaver. He introduced himself with a, “Is it my little Frenchie here?” follow by a bottle of Champagne Krug placed in front of the amazing view just above the vineyard. Mr Weaver explained and showed me the entire wine making process. I noted that they work with wood tank just like some Chateaux in Bordeaux and work really closely with the famous French oenologist Michel Rolland too. They have only 17ha of vineyard and work with the Bordeaux varietal grapes and nothing else. What is making Harlan’s wines so special? I will say their landscape and the way that they work their wines, it’s in the details and into perfection. 100% New French Oak barrels, blend of Cabernet Sauvignon, Merlot, Cabernet Franc and Petit Verdot. Mr Weaver chose to taste those two vintages because they are pretty similar. 2010 Harlan – The nose is pleasant but really discrete, on the palate the mouth is massive and deep on tight but fleshy tannins. I think that that wine was just really moody on that day and didn’t want to be tasted. But I did feel that important potential. 2008 Harlan – A wonderful warm nose of intense strawberries aromas with a delicious soft and round texture on the palate; I loved it! Such of wonderful moment at Harlan, it’s so good to see people carrying about young sommelier just thirsty of knowledge. To end up that day, one last tasting back in the area of Stag’s Leap at the winery of the same name – Stag’s Leap. Why is this winery and that area are so popular? In 1976 at the famous wine competition of Paris, wines were tasted in blind tasting and for the first time a Californian wine won! Stag’s Leap was the one and won so in front of all those prestigious Grand Cru of Bordeaux. Stag’s Leap is now owned by the Italian, ANTINORI. They had many well-known winemakers working for them and this one is a woman, Nicki Pruss. While I was expecting to taste pretty much the same style of wines that I have tasted earlier on in that area, I am really surprised that their style is the opposite of those massive big woody wines. It’s only one word to descript the red wines of Stag’s Leap – Elegance. My favourite is: 2009 Estate Cabernet Sauvignon Fay, Napa Valley which I found really well-balanced between the warm power and the freshness with a lot of spice such as clove. I learned during that day too and through the comments of several wine makers and people, that the Merlot it is not appreciated in California. It’s considered a cheap and grape with little interest by the public. To explain that, some people mentioned to me that a movie played an important role to the bad reputation of Merlot, the movie, “Sideways”, showed one of the actors saying repeatedly that “he hates merlot” … it could have influenced the public greatly. Before to take the road to San-Francisco, I had an appointment with Steve Messinger. I met him twice in Singapore in 2009 and 2011 while he was giving conference about Californian wines. I kept that business card thinking that one day I will realize my dream and go to California and it will be a must for me to meet Steve. He talks about wines with some much passion and has a huge knowledge about Californian’s vineyards; I really needed someone like him to help me to understand better Californian wines. He was waiting for me for a lunch in a cute Italian restaurant in the middle of the vineyard. What Steve thinks about it? – About the “Staves aging process” he understood that I could be surprise but he explained to me that, knowing the price of a wood barrel (Around $1200 USD for a barrel which can contain the equivalence of 300 bottles); how the winemakers can make a good value for money wine? When it comes to make a wine to be accessible to everyone at an excellent price like Cline Cellars does, the “Staves aging process” is an alternative. They could avoid the wood, but to respond to the American market they are better to have those “toasty”, “Smokey” aromas that the wood gives to the wine during the aging. – He gave me some explanation about the irrigation system that wineries in California have. It was chocking me and I mentioned that it was strictly forbidden in Europe, to respect the vintage/millesime’s effect. Actually, here if the didn’t have the irrigation system they wouldn’t be able to make wine, Steve said. They do not have rain from April to October! The addition of water is really important to avoid stress in the vineyard. The matter is all about controlling that irrigation. If they put too much water the yield will be huge but the concentration really bad…for a quality wine, the concentration is one of the base. – About my comparison between an adolescent and the Californian vineyard, Steve agreed with me. He adds to that a few points: The Phylloxera which destroyed the vineyard in Napa and all over the world in the late 19th century helped the wine makers to re-start on good base. They took that “opportunity” to re-plant only the grapes that they noticed were doing well, a kind of sorting of what they should grow, or not grow, in Napa. It wasn’t the first time that they were re-starting from the beginning to growth vines. From 1919 to 1934 the alcohol was prohibited in California. At that time people stopped growing vines to do something else, the only vineyard which survived were keeping to make the wine for the church. Steve adds too, that California has a huge and amazing topography and just like it took ages for French people to learn about their terroir, it will be the same for people in California. It was really good to talk with Steve, therefore I am going to meet up with him again soon. I always have a lot of question to ask! I started that day with a wine tasting at Clos du Val which is in the famous area and AVA of Stags Leap, south of Napa Valley. Clos du Val sounds really French doesn’t it? The owner Jean Golet has a French heritage and was dreaming of having his own winery in Bordeaux. Unfortunately, to get a Chateau in Bordeaux it is not an easy thing to do. In 1972 he decided so to open his winery in California and brought with him from Bordeaux a young wine maker Mr. De la Porte. It is really interesting to try an old vintage such as 1998. That vintage weren’t popular since it came after the 1997 which Robert Parker rated so well. However the 1997 didn’t age well and is not enjoyable anymore. The 1998 had better acidity which helped a lot and made it a vintage to keep. I really enjoyed it and was impressed especially after having met some people saying that, wines from Napa can’t age! On the nose, beautiful aromas from the evolution like fresh Paris’s mushrooms and liquorice. The tannins are still tight but definitely softer than any wines I have tried in California so far. Strong liquorice from the retro-olfaction, well balanced with the lovely freshness, delicious! The second stop was at Shafer in the area of Stags Leap too. I was that time, part of the touristic tour which made me a bit disappointed. I didn’t get all the information I needed, it’s true that I didn’t feel like asking many question in front of people since I can be very shy (It can sound unbelievable for people who know me but yes it’s true). And in anyways, I am not looking only for information which I could mainly find trough internet, but for some transmission of passion and stories… which I would share with my guests. Going all the way to a winery to get the same information that I could get online, it’s for me a waste of time, since it’s easy as a sommelier to taste almost any wines I wish to taste from suppliers. However, it happened that the touristic people there, the Shuler Family, were actually fabulous, we had a very interesting conversation; Them: Americans from California giving their point of view on French wines and me, “Frenchie” giving her point of view about what she understood so far about Californian wines. It’s interesting to know that for them a wine with orange reflection is basically a “dead wine”, something must be wrong with it. They drink strong purplish wines. They do not really know or understand wines on “evolution”, “aged wines”. That being said; In France we are starting to be like that too. We do not have the patience that our predecessor had to keep our bottles of wines, we don’t often have the cellar or the space to store them long time and properly, and the restaurant don’t necessarily have the budget to keep bottles aging in their wine cellar, it’s a huge investment. Therefore, I noticed that French are now drinking young wines and are not really use to “the taste” of an aged wine. How many times it happened to me that a guest complained, saying that the wine is oxidized or just bad, when actually it is on its apotheoses? Many times! I now keep in mind, to always make sure that the guests I am dealing with are aware of this. The making/vinification of their blend is done all together, ex: no distinction between the Syrah or petite Syrah for the wine making process or the aging which is for me really unusual. The wine I will remember: The 2010 Chardonnay, Carneros, Napa Valley, powerful and pleasant fresh nose, on toasty and exotic aromas such as litchi. Creamy mouth balanced with a crispy feeling ending by a long length. 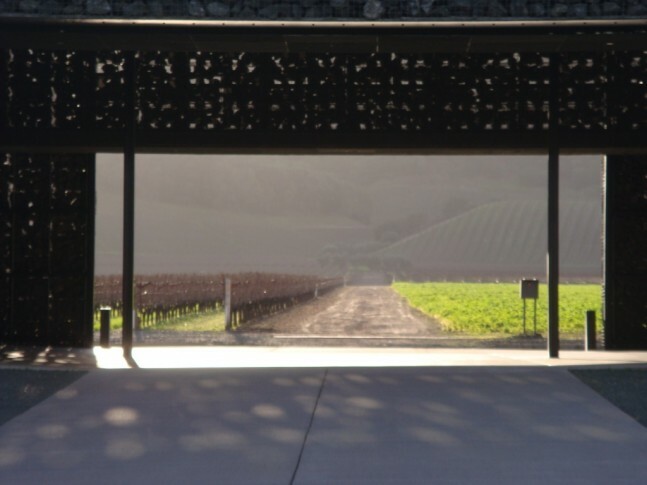 One more time I was really lucky that the doors at Dominus Estate were opened for me. Mr Moueix from Pomerol PETRUS with his friend Mr Mondavi made in 1983 their first vintage of the famous Dominus wine, right in the Yountville area, Napa Valley. Their wine making process and philosophy are the same then in Bordeaux and Mr Moueix comes often to make sure that everything is perfect. They Of course, use the Bordeaux grapes and age their wines only in French Bordeaux barrels. We can’t considerate Napanook as “a second wine” (Like we see often in Bordeaux), they are basically the same wines but from different blocks in the vineyard. Napanook is from the warmer side of their vineyard. 2009 was an amazing vintage at Dominus. I liked them both very much but preferred the Napanook. It’s true that when it comes to taste such of well known, rare and prestigious wines, it’s hard to have a bad impression about them. It could be really psychological. The best way to taste them and to have a real idea about those type of wines, it it’s to have them into a blind tasting. Being aware of this, I did my best to make abstraction of all the “noise” around those wines while I tasted them. 2009 Dominus: Rich and complex nose of strawberries aromas and some touch of woody aromas, like light vanilla. In the mouth it’s powerful but well balanced, really soft and elegant; the tannins are melted into the structure. I noticed that for a 2009 they already are enjoyable now. A 2009 from Bordeaux is absolutely not ready to drink now, from my last tasting I found them closed and the tannins really rough. Just the way they should be … That might confirmed what I mentioned above, Napa’s wines are accessible young however it doesn’t mean that the won’t last long… but how long? 10-January 2012- Day 2 – First day of wine tasting. I had to reach the winery of Cline Cellars which is in the Sonoma Valley, for 9.00am. I wasn’t expecting to find ice on the windows of my car; it is not something usually happening in Singapore… I guess I have to take back my old French winter habits! At Cline Cellars, Michael welcomed me, a very friendly person who gave me exactly what I needed to start that trip; some clue about the Californian History. History has always been one of my weaknesses; I wasn’t the type of young girl listening to my teachers at school. I understood now why some people here speak Spanish, California belonged to the Mexicans and I realized the fact that wasn’t so long ago since USA is actually a “new” country, they do not have a long history like we do have in my country, France. Being aware of those basics I have now a better idea of where I am. We say that the Californian vineyard is part of the new world wine country, now it makes sense to me. As I understood, even though they do have 100 years old vines, their oldest wineries were born in the 60s. I was lucky enough to meet the wine maker of Cline Cellars, Charlie Tsegeletos who showed me around the cellar (I missed so much that environment, I kept smiling like a dumb girl). We tasted from the tank, this is my favourite way to taste and it’s quiet challenging. I was surprise by the Mourvèdre which was really peppery just like some of those from my home town (Rhone Valley). They do not use any barrels for their white wines and do not make the “Malo-Lactic” to keep the freshness. Charlie showed me the “Staves process” which I heard a lot about and with horror when I was in France. They basically use the Staves of the barrels and put them into the tanks instead of using barrels which are really expensive. Charlie is satisfied about that process but I am not convinced … As we say “the truth is in the glass”. What I will remember and preferred the most: Viognier North Coast 2012- Excellent value for money, really representative of the viognier with a pleasant and intense nose of apricots notes; simple body, refreshing and easy to drink. At 11.00am I was arriving to my second appointment at the Domaine Carneros which produce mainly sparkling wines. They are owned by two companies, one of them is the famous Champagne house of Taittinger. Their first vintage was in 1997. They have 4 estates which are all in the Carneros area of Napa Valley. As at Taittinger’s winery they work on their sparkling wines with the same wine making process than Champagne, with one exception; they do not use any Pinot Meunier in their blend. I will remember the 5) 2006 Brut Blanc de Blancs, “Le Rêve”, in blend tasting I bet that just a few people will guess that it is not a Champagne. At 2.00pm I had an appointment at Hess collection, I can’t tell you much about it since they kind of forgot their appointment with me. The area where they are in is pretty nice, “The Mount Veeder”. I recognized the label of Lehmann on their portfolio, vineyard that they own in Australia and which we can find almost everywhere in Asia. The last tasting of the day but not least was at HDV … I was really looking forward to visit them and I haven’t been disappointed at all. Mr Aubert de Villaine from Domaine de la Romanèe Conti married a woman from California, Pamela Hyde. Both families decided to have their own vineyard here in the south of Napa Valley. It was exiting to discover what Mr De Villaine, one of those Burgundy’s kings, is doing on that part of the world. The wine tasting was even more interesting since their nephew Charles was here to take care of me. He knew how to share is passion with me and explain the philosophies of HDV. We had a long chat about Californian wines in general and it helped me a lot to clarify some thoughts that I have about it, but I will come back to that later on. They started to make Pinot Noir; the first vintage will be 2012. I will remember and actually loved; 2) 2009 HDV Chardonnay, Los Carneros. Riche and deep white wine, well balanced between the opulence and the freshness with some nuts and buttery aromas. To resume what I understood from that first day … Meeting those interesting person and tasting their wines today, gave me a first impression and some though, talking with Charles helped me to clarify them. People from the “old world’s vineyards”, when they talk about wines, they talk about appellation/area first; Americans and people from the “new world’s vineyards” when they talk about wine, they talk about grapes first. As a European it is something that I had difficulty to understand. A French person in a restaurant, will never order to me a glass of Chardonnay or Cabernet, they will ask me to suggest to them a glass of Burgundy or Bordeaux. I know, due to my experience, that some of them are actually not even able to tell you that Burgundy white is actually made of Chardonnay or that Bordeaux is mainly made of Cabernet Sauvignon, Cabernet Franc and Merlot. Why? Even if I could guess, it’s the question that I asked to those wine makers today. After their answers and after thinking about it, how can I expect Californian people to tell me about the appellation/area and they do not have any? They do have area but what winemakers do on it is not controlled as much as it is in Europe. California is a young vineyard; they do not have the experience or enough observation of their vineyards to be able to make rules. Those rules in Europe follow the notion of “terroir”, which is not strong yet in California. I compare California to an adolescent wanting to know themselves better without a lot of experience. What are those rules I am talking about? In Europe we have the “INAO” which gives the AOP to the appellation. You must follow the rules of the INAO to get the AOP for your appellation. Example: If you are lucky and have got a vineyard in Chablis; to obtain the “AOP Chablis” your wine must be made of Chardonnay, the vineyard must be on the area selected by the INAO, the yield are controlled, you are not allowed to irrigated ECT. Those rules have been made because after all those years of experience and observation the INAO and people from Chablis, they know what is “the basic of the recipe” to get a quality wine. In California, yes they have the AVA. But with that they can do whatever they want all over California (Except that they aren’t allow to Chaptalize (addition of sugar). The AVA basically make sure that when you have a bottle with on the label written “Carneros” (Which is one of the 12 appellation/area of Napa Valley), 95% of the grapes used to make that wine come from there. I guess the AVA is a first step of a long process. I could be right or wrong! I still have to appreciate Californian wines for what they are. After the amazing experience that I had in Italy last March, the Hilton has now sent me to California, for 3 weeks of intensives wine tastings. Well… to be honest I am a bit worry, I have never been interest into those massive American wines before. They are like the opposite of what my palate can enjoy. I mean… it is what I am thinking right now, I will see how I feel after all those coming wine tastings. It is for that specific reason that I asked the Hilton to send me to California. I do not want to be one of those Sommelier’s with a “close mind”, I want to open my mind to new horizon and discovery. Also, if I find I do not like certain types of wines, I want to understand why. As a sommelier it doesn’t matter what I personally like, my “job” is to bring people to what they do like. Finding for them what will fit to their palate/taste. What is the best wine? There is no “best wine”, the best wine is the one YOU like. We are all different, with different background and culture. What I may like, my guests might hate. I have to never forget this and make sure that I understand my guests before to advice them and of course to know my wines! So, let’s go! Feel free to join me!